The new 64-piece Harley-Davidson® Premium Tool Kit (P/N 14900033, $269.95) from Harley-Davidson® Genuine Motor Accessories features all the tools required for common maintenance on a Harley-Davidson motorcycle. 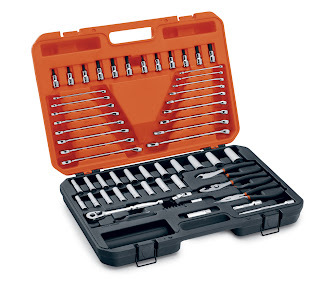 The heavy-duty tools lock in place in a hinged carrying case for simple organization. Tools feature large, easy-to-read size indicators, are stamped with the classic Harley-Davidson script, and have a lifetime warranty. The 64-piece Kit includes: Quick-Release Ratchet (3/8" Drive); 3" Extension (3/8" Drive); 6" Extension (3/8" Drive); Universal Joint (3/8" Drive); 11 SAE Deep Sockets 3/8"-1" (3/8" Drive); 8 Metric Deep Sockets 10 mm - 17mm (3/8" Drive); Spark Plug Socket 5/8" (3/8" Drive); 6 Hex Sockets 1/8"-3/8" (3/8" Drive); 6 Torx® Sockets T25-T50 (3/8" Drive); 8 Spinner Handle (1/4" Drive) with Adaptor and 6 Bits (Slotted, Phillips, Torx®); 9 SAE Combination Wrenches 1/4"-3/4"; 8 Metric Combination Wrenches 8mm-17mm; Diagonal Pliers 7"; Slip Joint Pliers 8"; and a Needle Nose Pliers 8".